Roller coaster phobia is scarier to some people on summer vacation than the thought of paying off those post-trip credit card balances. But how do you get over the fear of roller coasters? I’m living proof that anyone can get over their fear of roller coasters and other thrill rides. And if I can get over roller coaster phobia, anyone can! If you knew me when I was a little boy, you’d think I’d be the last person to ever ride a roller coaster. Over the years, I’ve become a certifiable roller coaster junkie. But it didn’t happen overnight. Sit back… keep your head back and all extremities inside your seat… and let me tell you how I overcame my fear of riding roller coasters! It seems a boy whose dad works at one of the biggest theme parks in Florida would have had no problem riding roller coasters — or any other major thrill rides for that matter. Alas, I was different than many of my thrill-seeking young friends. I was afraid of heights. I feared roller coasters. I wouldn’t even take the plunge on the log flume ride. While I wasn’t one of those kids who was afraid of his own shadow, I certainly wasn’t a big fan of strapping into an unusual machine and letting it take me along 3,000 feet of track at 65 miles per hour. Getting over my roller coaster phobia started with a trip down a big wave slide at the local fair. The slide looked innocent enough. But it stood more than 40 feet tall and provided me with plenty of airtime as I hurtled over each of the waves down the 100-foot slope. “Ooh, that was fun!” I thought. I was 12 years old. I wondered if the log flume ride at the theme park where my dad worked was just as fun. After all, the log flume and the slide at the fair were about the same height. I figured if I had fun on the big slide, maybe I’d survive the log flume ride. And so I did… And I had a blast! I had heard the stories about when my mom and dad rode the park’s first roller coaster — a 1976 steel coaster with two corkscrews. It was a big deal when it opened, but it looked relatively tame as compared to the park’s newer roller coasters. “You might like it,” urged my mom and dad. Each of the seats on the coaster had an over-the-shoulder harness, so at least I’d be locked into the ride pretty well. “I guess I won’t fall out of the ride,” I rationalized. Guess what? I rode that old roller coaster — and I didn’t fall out. I started crushing my roller phobia. Now that I had ridden my first roller coaster — which also happened to be my first upside-down ride – I was ready to tackle the bigger roller coasters at the theme park. Next up? A mid-1990s roller coaster that, when it opened, was one of the biggest, fastest, tallest roller coasters in the United States. It stood twice as tall as my first roller coaster, was 3 times as long, and had more than 3 times as many inversions. But that over-the-shoulder harness sold me — I knew I wasn’t going to fall out of the ride. Still, I wasn’t so sure about riding a roller coaster that stood 14 stories tall and boasted what was the world’s largest vertical loop. Luckily for me, a point-of-view video (POV video, like the one above) of that roller coaster was available. I must’ve watched it more than a dozen times in a row, preparing for the order of the ride’s elements, how long it would take to clear each element, etc. Let’s just say I took the whole preparing-to-ride-a-new-roller-coaster thing a little seriously (ha ha). But it worked. I buckled into the ride — and 2 minutes, 54 seconds later, I had successfully tackled what was one of the largest, scariest roller coasters in the United States. When it came to riding roller coasters, there was no stopping me. I no longer had roller coaster phobia! 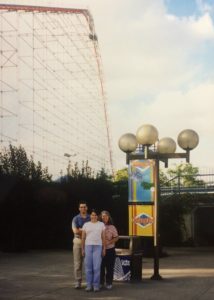 A few years later, my family and I won a roller coaster vacation to Cedar Point in Ohio. If you haven’t heard of that place, believe me — your roller coaster riding friends know all about it! Cedar Point, is after all, an amusement park that is widely billed as The Roller Coaster Capital of the World. And every one of those roller coasters we had time for, I rode. 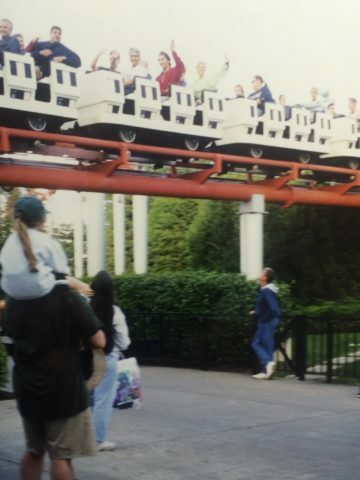 All these years later, roller coasters have gotten taller, faster, longer, and scarier than the theme park industry could’ve imagined when I sat in the seat of my first big thrill ride in 1994. 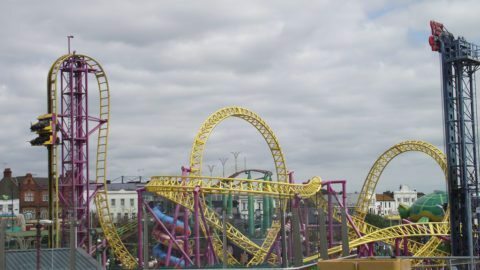 But, as the industry grew and the rides did, so, too, did I — all the while, my fear of riding roller coasters melted away as I graduated to riding larger and faster roller coasters and other thrill machines. Everybody will give you their own tips for conquering the fear of riding a roller coaster. Here are mine — they come from personal experience, and I hope they help! Ride with a friend — I think my favorite way to ride a roller coaster is with somebody else. It could be a bona fide roller coaster addict, or it may be somebody else who is also trying to break their fear of riding roller coasters. Wouldn’t it be awesome if you and your bestie got over your roller coaster phobia together? Ride in the middle of the roller coaster train — Some of the most extreme forces felt on a roller coasters occur in the front row and back row. 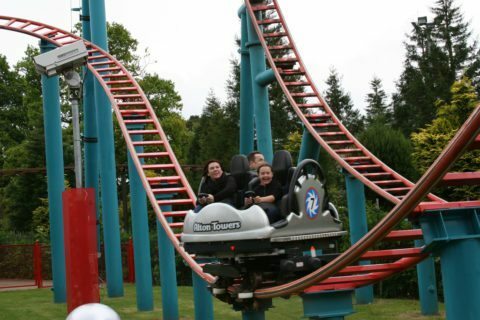 Riders in the middle of the roller coaster train usually experience the relatively least severe of the gravitational forces on a roller coaster, and this may help you to conquer the ride without feeling its strongest, most intense sting. Watch the ride for a while… or don’t — Some people, like yours truly, need to see what he’s going to experience on the ride before actually committing to it. Others, however, would rather not torture themselves this way. The choice is up to you. As far as I’m concerned, I want to know what I’m about to get into before strapping into the ride. After all, once I’m in, I’m not getting back out until the train pulls back into the loading station! Start off riding small roller coasters — This is, as I mentioned, how I really got my start with riding roller coasters and other thrill rides. You might consider hopping on a non-looping ride — such as a wild mouse roller coaster — to get your feet wet before taking bigger (and taller) plunges. Don’t eat right before riding the big rides — This piece of advice goes out not just to newbies, but also the more seasoned riders, too. In my case, I’m physically pretty acclimated to thrill rides, and I’ve never had a gastrointestinal emergency due to riding roller coasters. Let’s see how long that personal record of mine will last! 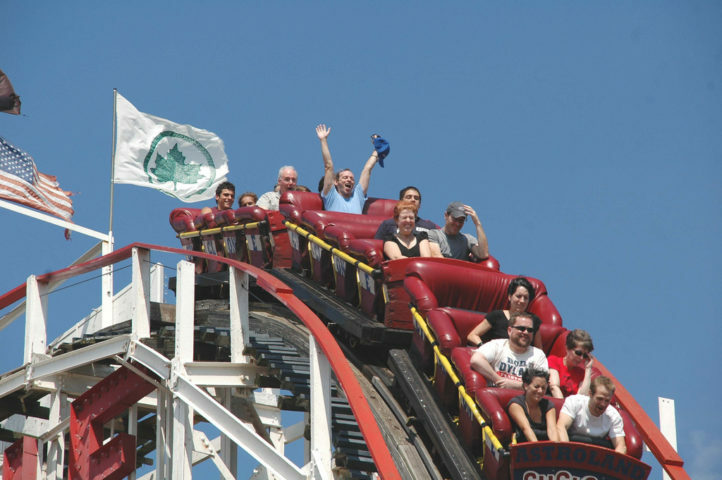 Awesome Roller Coaster Facts, Including The Tallest, Fastest, Most Loops & More! 9 Of The Scariest Roller Coasters In The U.S.